Styling is a key element for beautiful, timeless maternity photography. For portraits we suggest maternity gowns, luxe skirts, coordinating tops, lace robes, and fabrics to flatter your beautiful curves of pregnancy. For outdoors sessions, we recommend outfits that accentuate your shape. Maternity sessions are delicate, and we patiently take the time to style and perfect each pose. Our detailed approach allows us to capture those stunning moments that become the most beautiful, meaningful portraits. Our Mini Session is a wonderful way to capture a smaller selection of beautiful maternity portraits with a smaller price tag. Mini Sessions are offered on select days. Art takes time! But rest assured, it’s worth the wait. For every minute we spend together with you, we spend hundreds more behind the scenes to make your portraits and overall experience exceptional. Following your Maternity Portrait Session, we carefully compare the hundreds of images from your session to select the best images from each concept — based on facial expressions, posing, lighting, sharpness, background, and overall appeal. These final selections are each individually hand edited in color, as well as black & white. We are happy to retouch minor blemishes, stretch marks, and bruises to make sure you look your very best. You will receive your private online gallery of beautifully edited maternity portraits within 3-4 weeks of your session to make your order selections. Like most professional portrait photographers, we do not release RAW files, since these are merely the rough drafts essential to achieve your final portraits. If you would like your products to arrive in time for a baby shower, please notify us in advance, and we will try our best to accommodate. We are always happy to advise on creative ways to display your maternity portraits. We encourage you to take measurements and snapshots of your wall spaces, so we can show how different wall art displays will look in your home. Whether you’d prefer a modern contemporary style or rustic chic, we’ll work together to ensure your custom works of art fit your home perfectly. These are your first moments of motherhood, and they are priceless! A maternity portrait session is the perfect way to capture your gorgeous glow and intense emotions as timeless art. At no other point in your life will a photographer ask you to stick out your belly. Enjoy it! Our maternity photography sessions are customized to reflect your personality and style. We strive to create a relaxed and comfortable experience, while capturing a variety of artistic portraits. With an eye for perfect moments and unique perspectives, we create maternity portraits that are beautiful, intimate, and emotional. We’ll help with styling and posing, and apply our expertise in artful lighting and editing to bring out the best in your maternity portraits. We love getting to know each of our clients, and creating one-of-a-kind maternity art that you will treasure forever. Maternity Photography Sessions fill up quickly, and it is always best to contact us as soon as possible for an appointment. 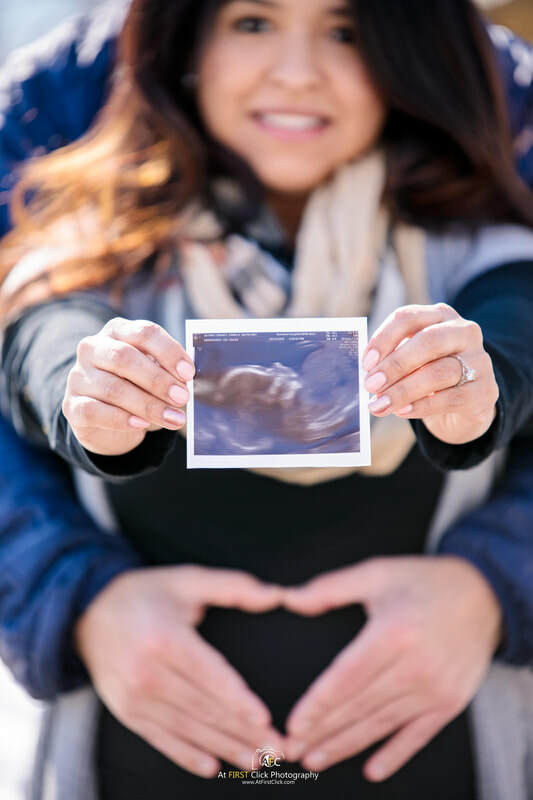 Maternity portraits are best captured around 32 to 36 weeks, when your belly is round and curvaceous, but can be scheduled all the way up until your due date. This timing can be different for everyone, so we encourage you to give us a call to discuss. Whether you prefer fine art maternity photography in your own home, or stylish lifestyle photos outdoors, there are endless possibilities for beautiful maternity art. The comfort of your own home is a warm and cozy environment with an abundance of natural light. We also offer maternity portraits in the natural splendor of the outdoors. We have lots of favorite locations, and we’re always happy to help you select the ideal setting!